Is The Sportstech VP210 Vibration Plate Easy Enough For Everyone? 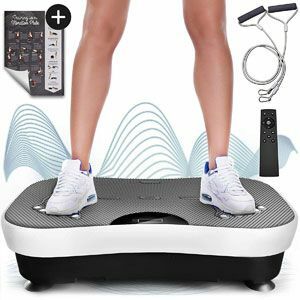 Vibration plates like the Sportstech VP210 Vibration Plate appeal to lots of people that want to improve their weight and fitness. This model comes with lots of great sales promises about the results that can be seen, the quality of the vibrations and the additional features. There is a lot here to appeal to the average user. But, does it have the performance to match? Is The Sportstech Professional Vibration Trainer VP300 Powerful Enough? The Sportstech Professional Vibration Trainer VP300 is an eye-catching option for those working on their home workout in more ways than one. Some vibration plates are built to be small and compact for at-home use. This one goes in a completely different direction by providing a much larger, more powerful system. The idea here is that buyers should be able to enjoy a greater motion and more power. Therefore, a better chance at achieving their workout goals. Is this the case, or could this product still do more to appeal to a mass market?